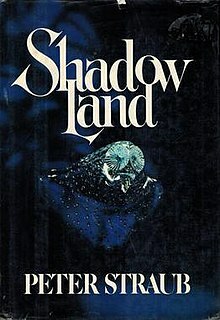 Shadowland is a novel by Peter Straub, first published in 1980 by Coward, McCann and Geohegen. It is a horror novel that has strong elements of fantasy. It was the first book Straub wrote following his highly successful Ghost Story. The story concerns two young boys, Tom Flanagan and Del Nightingale, who spend a summer with Del's uncle Coleman Collins, who is one of the foremost magicians in the world. As time passes, however, Tom begins to suspect that what Collins is teaching is not a series of harmless tricks, but is in fact real sorcery. Parts of the novel involves a thinly disguised version of Milwaukee Country Day School, which Straub attended. This article about a horror novel of the 1980s is a stub. You can help Wikipedia by expanding it. This page was last edited on 31 October 2018, at 11:28 (UTC).